One reading skill that I think it often missed is teaching students to ask questions. I think that our students are fully capable of developing questions, regardless of their reading level or learning abilities. It is something that ALL of our kids are able to do on some level. Several years ago, I read the book Comprehension Connections by Tanny McGregor. She has several ideas to introduce various reading skills, and I highly recommend it. This was one of many ideas she shares in her book. Will I like the taste of it? Does it taste like rice or pasta? This step is representative of what we as readers do before we read a book. We are wondering if we will enjoy it. We might be wondering if it is similar to something we have already read. We also might be questioning whether the text will be too easy or too hard. There are no right or wrong questions. Do we need to stir it? What happens if we put too much water? This portion of the activity is just like reading a text or passage. 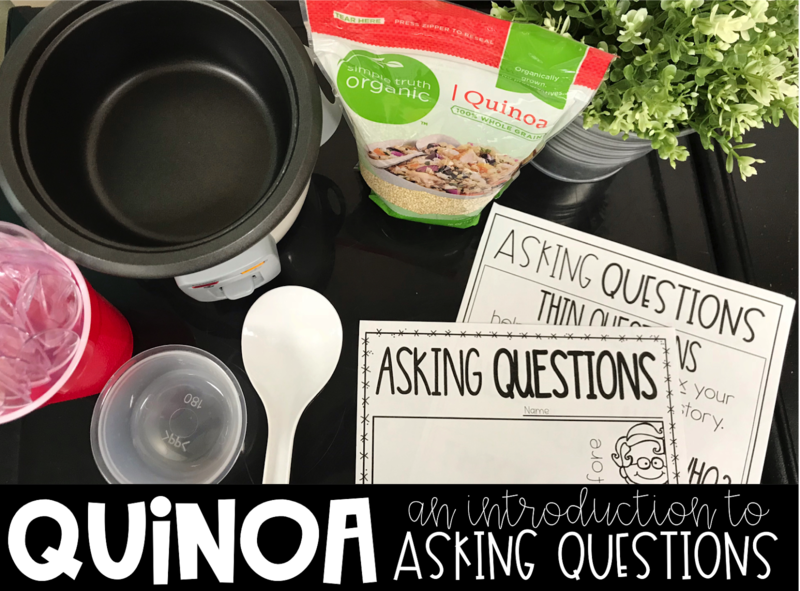 While we are making our quinoa we might be asking ourselves clarifying questions. The first three questions above are all things that we can find the answer to by going back to the recipe on the bag. Remind students that questions cannot always be answered within the text. Some questions require research outside of the text, such as what happens if we put too much water. We may have to experiment or look at another source other than the recipe. Would I ever eat this again? What would go well with quinoa? Is this healthy or unhealthy? I feel that the questions in this section are often similar to the first section. What questions are still remaining after finishing quinoa, a chapter book, a short reading passage, or a picture book? It doesn't matter what you are reading, you might have questions that are still with you after you finish reading. Would you read this book again? Would you read another book by this author? How did you feel about the main character? Are there BIG questions that the author left unanswered? Would you like the graphic organizer and anchor charts that I use when completing this activity? You can download them by clicking on the image above.